It wasn’t quite the way one wag described it: white belt brigade meets wizened pro. But the generation gap was visible at PGA Golf de Catalunya as two Irishmen crossed paths on the eve the dreaded European Tour Qualifying School finals. While 21-year-old Niall Kearney will make his professional debut today, 37-year-old Kilkenny man Gary Murphy has earned over €2 million from 257 European Tour starts over the past decade. If he had picked up another €16,000 this year, Murphy wouldn’t be making his first appearance at the Q-School since 2002, bidding to finish inside the top 30 and ties after six rounds to regain his card. As Murphy worked on his putting - “If I putt well, I shouldn’t have any problems and if I don’t, I might” - the beanpole figure of Kearney watched the sun set on the final day of his amateur career. By deciding not to sign a form waiving his right to the €131,761 in prize money that the top 30 finishers will split at the end of six rounds, the Walker Cup player from Royal Dublin will hit his first shot as a professional today. "Niall, realistically, is under no pressure. He can just go and play," Murphy said with a hint of envy. But while Kearney cruised through the second stage last week, finishing with rounds of 67 and 66 to claim a share of second place on 12 under at the Cost Ballena resort course near Cadiz, he knows this is different. “Last week’s course was very scoreable but these two are a lot tougher,” said Kearney. "It's target golf and I just have to hit the shots." With three management companies waiting in the wings for his signature, his first objective is to make the 72 hole cut and earn a Challenge Tour card. “After that it is a bit of a shoot out for the top 30,” he said, though he is already confident he will get six or seven invitations. The Irish sextet is completed by Clandeboye’s Jonathan Caldwell, Challenge Tour regulars Simon Thornton and Colm Moriarty and St Margaret’s John Kelly, who will have Padraig Harrington’s brother Tadhg on his bag. “I got the finals four years ago and was like a rabbit in the headlights,” said Kelly, who has been transformed since he started using the same back room team as Ireland’s three-time major winner. 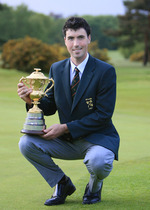 “Thanks to 'Harrington Golf', I am a totally different player. It's time to finish the job." Colm Moriarty crafted an immaculate five under par 65 to spearhead Ireland’s challenge in the first round of the marathon European Tour Qualifying School finals at PGA Golf de Catalunya. 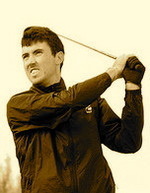 The 30-year old midlander carded five birdies in a fine ball-striking effort on the easier Tour Course but amazingly still found himself sharing seventh place behind Julien Guerrier of France, who blasted 11 birdies in a sensational 10-under par 60 on the same track to top the leaderboard by four strokes. Jonathan Caldwell kept his hopes alive of winning back his European Tour card after a brave third round 68 catapulted him above the cut line at the Qualifying School finals in Spain. The 25-year old former Walker Cup player from Clandeboye fired six birdies and two bogeys in a four under par effort on the terrifying Stadium Course at PGA Golf de Catalunya to leap from 96th into a tie for 61st on two under par. England’s Simon Khan and Charlie Ford lead by a stroke from compatriot Jamie Elson on 14-under par with the top 70 and ties making the cut today and the top 30 and ties earning tour cards after six rounds.